With 2009 marking our 75th year in business, Walnut Avenue Ranch is owned and operated by the Meyer family, headed by founder Helmuth Meyer, and partnered by son Melvin. The business is located on the old family ranch adjacent to Stony Creek near Orland, at the heart of the fertile Sacramento Valley in Northern California. At the ranch’s center are the nut and candy factories, store, and black walnut operations. The business started with the processing of California black walnuts, and it continues to be a major part of our operations. For those unfamiliar with black walnuts, they have the strongest flavor and most highly unsaturated oil of any nut, making them excellent in ice cream, chocolate, and baked goods. 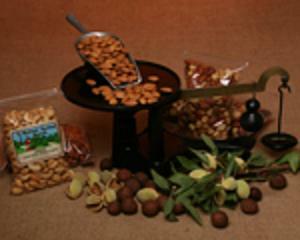 We also process California almonds, walnuts, and pistachios. Along with other nuts such as cashews, pecans and filberts, they are distributed to stores, bakeries, and ice cream and candy industries. We specialize in custom roasting, especially of almonds, with a choice of 14 delicious flavors, which range from sweet and savory to salty and spicy. Some of our other products are raw nuts and seeds, roasted seeds, our own nutritious trail mixes, original all natural nut butters, convenient dried fruit, and our unique natural confections. ALL of the almonds, walnuts, pecans, and pistachios we process are harvested from neighboring farms, and are of the highest quality. Many of our other products, whenever possible, are California made, including the chocolate we use. Our candy factory produces hand-dipped chocolates in premium milk, semi-sweet, and white chocolate, including the traditional and healthful nut clusters, dipped dried fruit, various chewy caramels, soft creams, fancy truffles, barks and many other mouth-watering Walnut Avenue Ranch specialties. 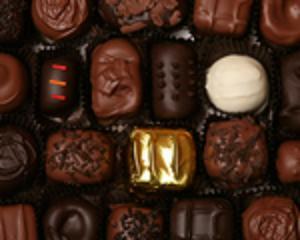 For those with dietary restrictions, or who want to avoid extra calories, we offer hand-dipped sugar-free chocolates. We also make caramel popcorn, and nine rich and buttery flavors of premium nut brittles (cooked in copper kettles, loaded with nuts, and hand pulled for proper consistency.) During the holidays, we expand our product line to make special festive goodies, such as peppermint bark and pistachio biscotti. Also, check us out for elegant Valentine chocolate boxes and fun and creative Easter treats. As with all our products, we use only the finest ingredients, without adding trans-fat or preservatives. For our customers’ convenience, we also operate a store on our ranch location, selling all of our freshly made nut and candy products. A wide range of popular gift packs, baskets, and tins, decorated for your special occasion or holiday, are available for easy gift-giving. Small individual or large corporate orders are equally welcome. Custom orders are also accepted; we believe our customers should be able to get exactly what they want. We gladly pack and ship by UPS, and will even enclose complimentary gift cards if requested, with your personal message. And last but not least, our visitors can sample free chocolates and flavored almonds while shopping.